Membership of international groupings/organisations: African Development Bank (AFDB), African Union (AU), Central African Economic and Monetary Community (CEMAC), Organisation Internationale de la Francophonie, United Nations (UN), International Monetary Fund, World Health Organisation, World Trade Organisation (observer). Equatorial Guinea was one of the fastest growing economies in the world due to investments in its recently discovered large reserves of oil and gas. Foreign direct investment inflows reached $US1.86bn in 2005, the third largest in sub-Saharan Africa. Real GDP growth in 2008 was 10.7% but this has since fallen to about 0.8% in 2010 as the price of oil and the production level fell. Oil production is estimated at 346, 000 bpd and proven reserves are estimated at 1.1 bn bpd. It is not a member of OPEC. On current projections, there is an estimated 10 to 20 years' worth of reserves. Equatorial Guinea was accepted as an EITI Candidate country in September 2007; however the EITI board did not accept their request for extension of the deadline for completing EITI validation. An impressive GDP from oil revenue masks stagnation in the rest of the economy, with timber and agriculture only minor sources of exports. The island of Bioko was ceded to the Spanish in 1777 by its original Portuguese colonisers. Spain then went on to settle the mainland province of Rio Muni in 1844. In 1904 the 2 territories were united as the Western African Territories and later renamed Spanish Guinea. Spanish Guinea achieved independence from Spain in March 1968 and became the Republic of Equatorial Guinea. Following multi-party elections, President Francisco Macías Nguema swiftly established absolute power. 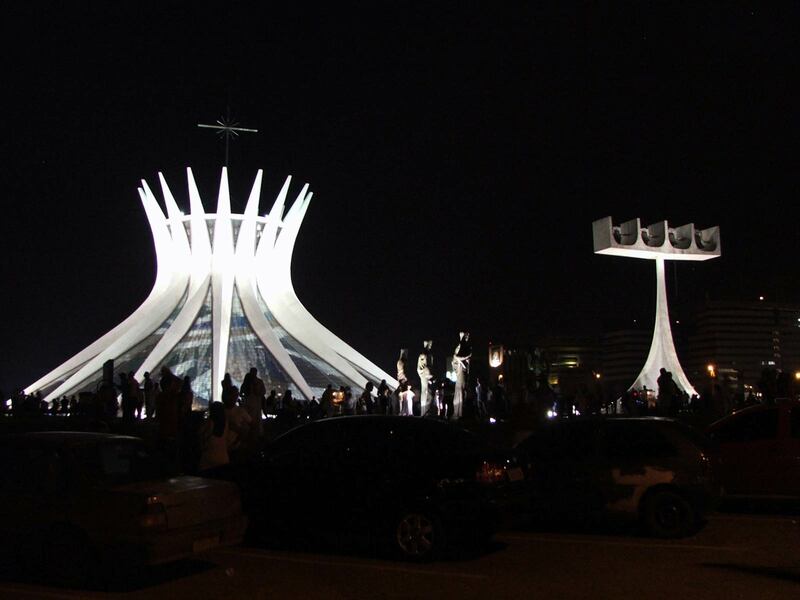 A third of the population fled the ensuing repression and the economy collapsed. Teodoro Obiang Nguema M'basogo, nephew of the President and commander of the National Guard, seized power in a coup in August 1979. Macias was arrested, tried and executed. Obiang has since remained in complete control despite several reported coup attempts and the formal acceptance of the principle of multi-party democracy in 1991. In March 2004, 14 people were arrested in Malabo and 67 in Harare, Zimbabwe for their alleged involvement in an attempted coup to overthrow the Government of Equatorial Guinea. All were tried and convicted in the country in which they were arrested. 62 of the men arrested in Zimbabwe and 6 Armenians in Malabo have since been released. In February 2008, the British national Simon Mann, an alleged coup plotter, was extradited from Zimbabwe to Malabo. However, in November 2009 he was released after receiving a presidential pardon. Equatorial Guinea has relatively positive relations with its neighbours, despite occasional clashes over maritime boundaries with Cameroon, Gabon and Nigeria. Tensions with Gabon over their Maritime border have continued despite UN-mediated negotiations in 2004. Despite revived Spanish interest, Equatorial Guinea has gradually shifted towards its Francophone neighbours, and is a member of the Central African Economic and Monetary Community (CEMAC). It joined the Franc Zone in 1985. The USA and China are major markets for its oil. China agreed a US$2bn credit line in late 2006 to help fund infrastructure projects. Nigeria signed an agreement in late 2006 to supply natural gas to the LNG plant in exchange for oil exploration rights. France remains the second-largest contributor of development aid after Spain. With American-based international oil companies leading the development of its oil fields, the USA has become the country's largest foreign investor. In 2003, the Department of State re-established a limited diplomatic presence in Malabo after an 8-year absence. The UK is officially represented in Equatorial Guinea by its diplomatic mission in Yaoundé, Cameroon, from where the Ambassador regularly visits. Equatorial Guinea opened its Embassy in London in 2005 and is represented by HE Mr Agustin Nze Nfumu. There have been no recent bilateral visits. However, the Minister for Africa attended the African Union Summit held in Malabo in June 2011 on multi-lateral business. 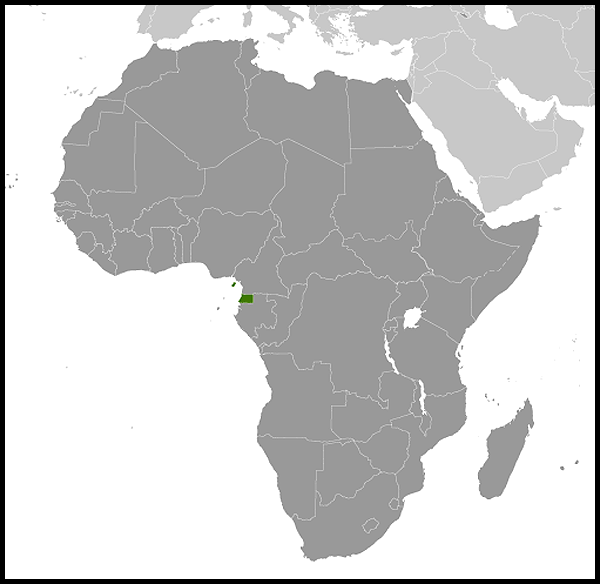 Equatorial Guinea consists of several small islands off the Cameroon coast and a small section of the African mainland between Gabon and Cameroon. 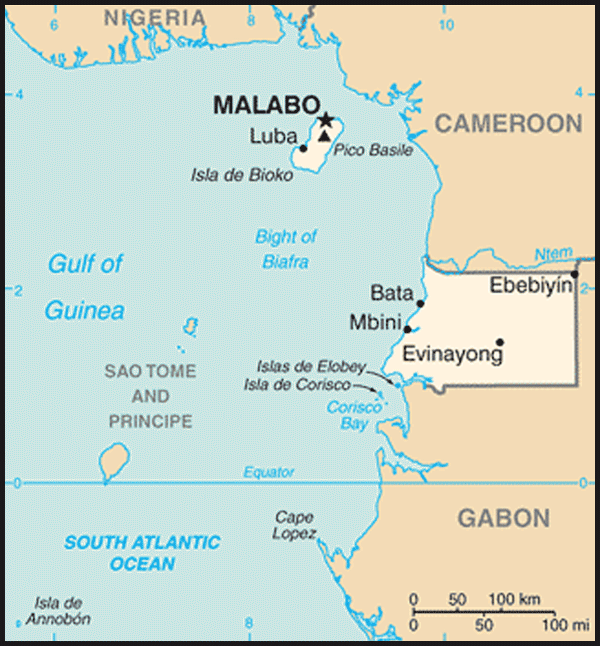 The capital, Malabo, is on the largest of the offshore islands (Bioko), although 80% of the population reside on the mainland. The islands are volcanic, while the mainland is forested, rising to mountains inland. UK exports to Equatorial Guinea were worth £43.5 million in 2009, rising to £113.4 million in 2010 . UK imports from Equatorial Guinea were worth £15.9 million in 2009, rising to £18.8 million in 2010. Equatorial Guinea's human development index ranking has deteriorated in recent years, with a wide poverty gap despite massive oil revenues. There continues to be insufficient transparency and accountability, with wealth concentrated in the hands of the few. One of the biggest inhibitors to improved economic performance is the lack of educated or skilled personnel, stemming from years of under-funding for education. Managing the sudden influx of oil revenues is a major problem. Life expectancy is 60 years; there is an infant mortality rate of 81 deaths/1,000 live births and an estimated HIV/AIDS prevalence rate of 3.4%. The UK has no development programme in Equatorial Guinea. Equatorial Guinea is nominally a multi-party democracy but there is little effective political opposition within the country. Power is concentrated in the hands of President Obiang, who won the last presidential elections in 2009 with over 95% of the vote. His political party, the Partido Democratico de Guinea Ecuatorial (PDGE), secured 89 out of the 100 seats in Parliament. The judiciary and legislature are subject to presidential control. The elections were widely seen as flawed. The discovery of large oil and gas deposits in the mid-1990s have in part stimulated the separatist Mouvement d'Autodetermination de l'Ile de Bioko (MAIB) as well as rivalries between the dominant Fang community from the mainland and the minority Bubi natives of Bioko. A number of members of the secessionist MAIB are presently in prison, along with members of the FDR, following the 'attempted coup' in April/May 2002. There is a self-proclaimed ‘Government in Exile’ based in Spain, led by former Minister Severo Moto of the Partido del Progreso de Guinea (PPGE). Equatorial Guinea has a poor human rights record. The use of torture, arbitrary detention, and restrictions on freedom of speech and assembly has been widespread and systematic. It is thought that as many as one third of Equato-Guineans may be living in exile abroad because of fierce political repression over the last two decades. Reports indicate that security forces continue to commit various human rights abuses, including torture, arbitrary arrest and detention, though there were fewer reported incidents of such abuses than in previous years. Members of the security forces were allowed to commit these abuses with impunity. The judiciary in Equatorial Guinea is heavily controlled by the State, and the government severely restricts the freedoms of the press and of speech. Domestic radio broadcasting is controlled by the state, journalists must register with the Ministry of Information and the law authorises government censorship of all publications. In August 2010 four nationals were summarily executed within an hour of sentencing for an alleged attempted coup against President Obiang. The French appeals court has authorised magistrates to investigate charges against the President and his family of embezzlement of public funds, particularly the extravagant expenditure by his son Teodorin Obiang. Media reports and human rights groups have also condemned the extravagance of the ‘resort’ that the President had constructed for African Union Summit.